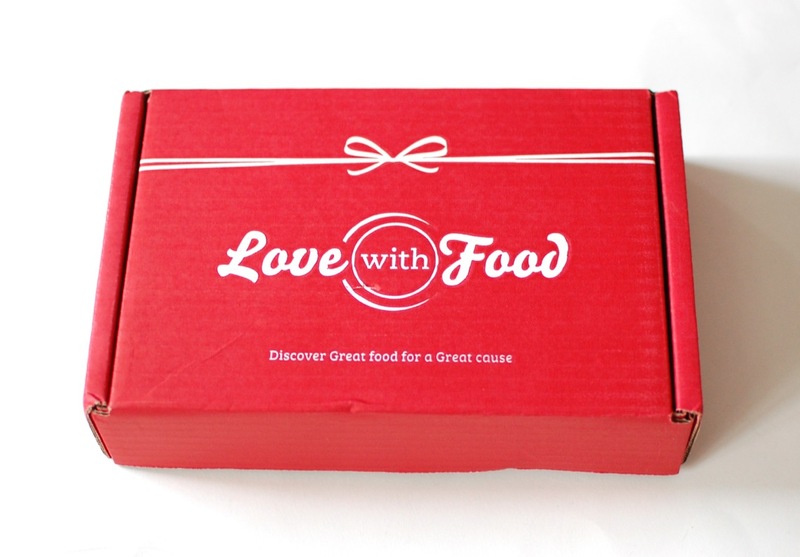 Love With Food February 2014 Review & Discount Code! Love With Food time! This month’s theme is “A Kiss to Build A Dream On”. Ooh… how poetic. And Valentine-y! I love seeing this bright red box in my mailbox every month! Beanitos Restaurant Style White Bean & Sea Salt Chips – I’ve never had this brand of “bean chips”, but I’ve had others that are super good. Hopefully these are just as tasty. They’re made with navy beans & non-GMO whole grain rice and are gluten-free/vegan. Mario Camacho Pitted Green Snack Olives – Yay! I actually really like green olives, so I was happy to get this little pouch. Black olives, on the other hand, blech! These made for a nice little 30-calorie snack. The hint of garlic was a nice touch too. TCHO Chocolates – 2 different chocolates were included: “Mokaccino” (milk chocolate with coffee) and “Chocolatey” (dark chocolate). I passed the milk one along to my mom and kept the dark one for myself because it’s vegan. Woo! Always happy to see vegan chocolates in my LWF box! Gavottes Dark Chocolate Crepe Dentelles – These little guys are made of thin crusty biscuit layers rolled up and covered in chocolate. It’s a French recipe that dates back to the 1920’s. Sadly (for me), they’re not vegan-friendly. Boo! Back to Nature Honey Graham Sticks – These are perfect for the girls! Little graham cracker sticks made without any artificial flavors or preservatives. I actually won a coupon for a free Back to Nature product on their Facebook page, so hopefully I can find more of these at Wegmans! Emily’s Dark Chocolate Covered Blueberries – I was sooo hoping these were vegan, but sadly, they are not. Wahh. These are whole blueberries covered in rich dark chocolate. There are no artificial flavors, colors or preservatives. Biscotti di Suzy Chocolate Chip Biscotti – Handmade biscotti made with all natural ingredients and sprinkled with chocolate chips. 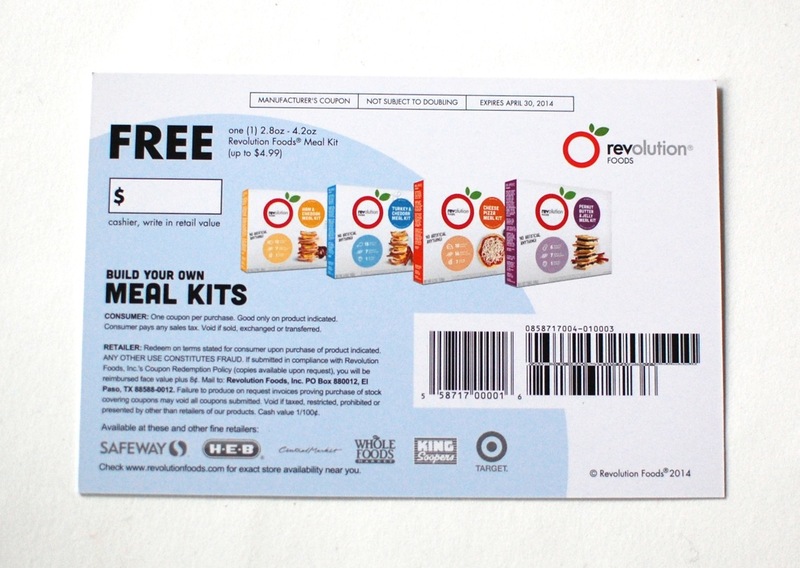 Coupon – This was a nice “bonus” coupon for a free “Revolution Foods Meal Kit” (up to $4.99). I’ve never noticed these at our local Wegmans, but it looks like they carry them at Target so I might have to make a trip there soon. Yay free stuff! Chip Clip – Another “bonus” item! I was actually really excited when I heard about this being included in the box. 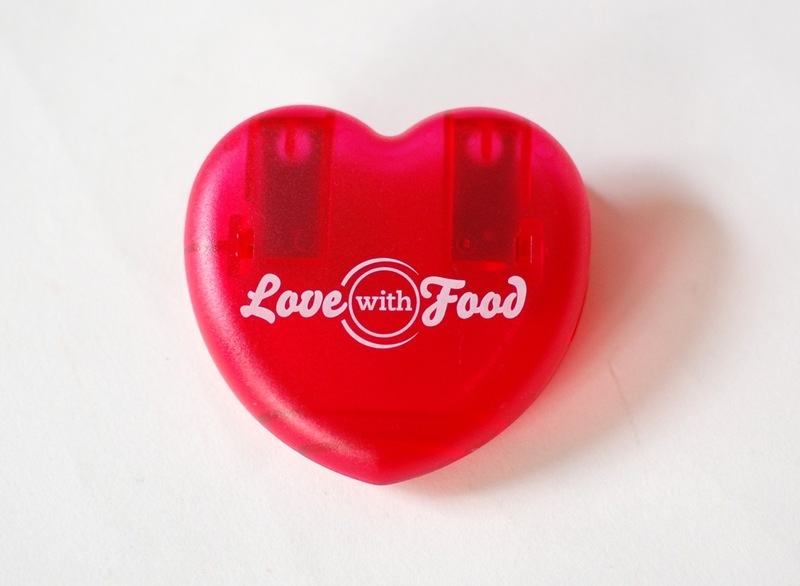 We always run out of chip clips in our house (we use them for pretty much everything except chips), so I was more than happy to get this cute heart-shaped one. I wasn’t overly thrilled with the food items this month, but the bonus items totally made up for it! 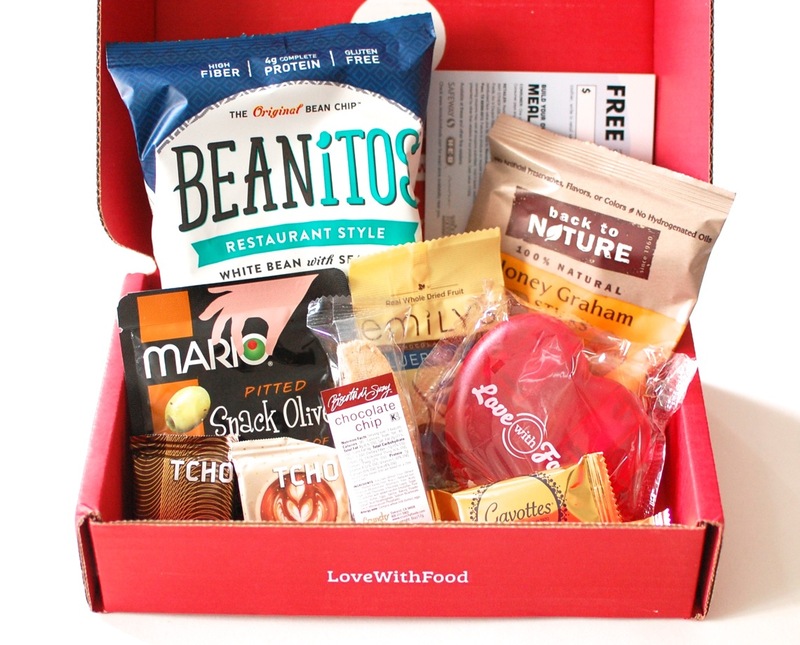 If you’d like to sign up for Love With Food, they’re currently offering new members their first box for just $5 when you use the promo code “FB7OFFER”. Just click here and enter the code at checkout! — I heard it also takes $10 off of the deluxe box as well! Woo! Disclosure: I purchased this box on my own. I was not compensated in any way. All opinions are my own. Post may contain affiliate links.